← What does it mean to be brave? 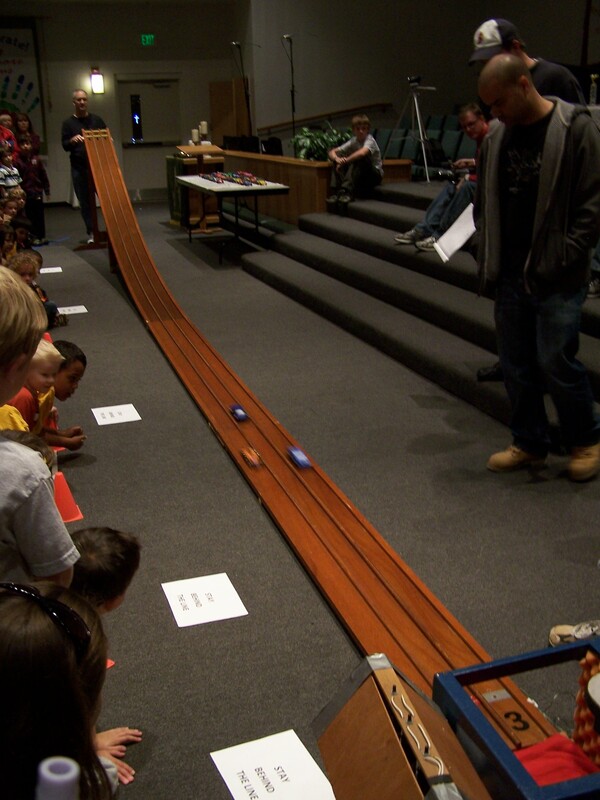 Yesterday was the Pinewood Derby for my son’s Cub Scout troop. We made what we thought was a pretty good car. It was NASCAR themed, and looked good, with shiny metallic paint. We carved a space in the back for adding weights, and got it to exactly 5.000 ounces, the maximum, giving it as much potential energy as we could. Alexander's is the Blue one above the 66. Two car lengths behind in the center track. 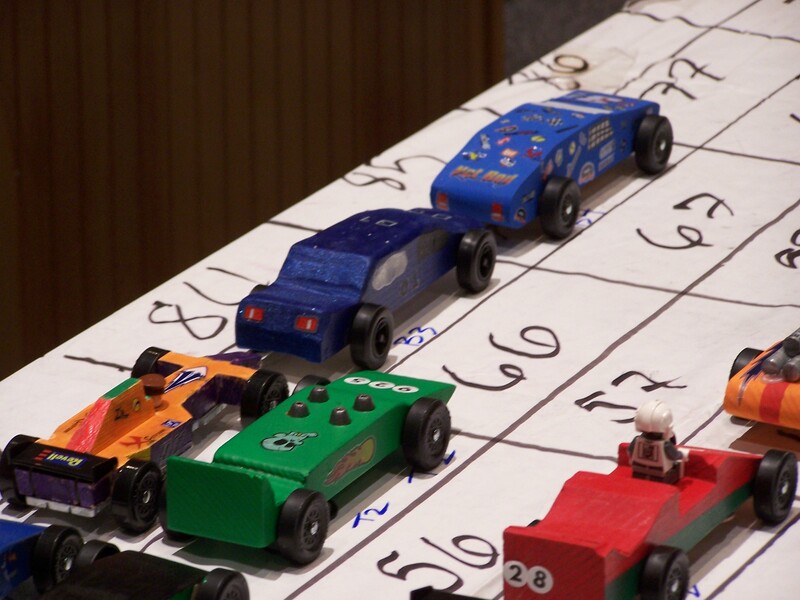 Immediately after the first heat, Alexander’s demeanor changed from joy to sadness, though there was still a small spark of hope since each car did 3 heats, changing lanes each time. The second heat was just as bad, and all hope was abandoned. Alexander didn’t even stay on the line to watch his third race. I’m actually very proud that he didn’t cry, though I know he would have liked to. We worked hard on the car and thought it would do good. Getting the weight exactly to the max seemed like a good omen. I was able to cheer him up a little bit by the time of the final races. One of his best friends came in first place, so Alexander was very happy for him, and watched his heats with him. And after the races, Alexander got to pick lunch (Pei Wei) and we went to Menchies for frozen yogurt. We think that our issue was probably wheel alignment, or an axle issue in retrospect. And maybe there are some things we can do to the car design for next year. So rather than dwelling on the negative, we’re looking towards improvements in the future. Minor changes, like sanding the axles before we polish them. Major changes like changing the shape of the car. We even have discussed adding golf ball-like dimples all over the surface, a la Mythbusters. Maybe we should build a little test track to see if it goes straight and doesn’t rub against the edges. It takes trial and error. And really, maybe this is a good lesson for other kinds of depression that we all face from time to time. This isolated moment of time was relatively easy to overcome. Real depression never is. But dwelling on the negative, NEVER makes things better. It’s easy to lie in a fetal position and listen to the heartlike backbeat of emo music, while the darkness comforts us like the womb. But we need to find ways to focus on the future, and look to improvements we can make, from minor to major. And there needs to be some allowance for trial and error. Things don’t get better immediately. I encourage you to seek out the little things that make you happy. Maybe start with a little change, like just switching to Katrina and the Waves instead of the Morrissey. It’s hard to wallow when you listen to Walking on Sunshine. I’m not an expert on depression, though I do have some firsthand experience. But we mustn’t dwell. Not on Rex Manning Day. The little things matter! Let’s let the good and positive things outweigh the negatives! So how about you? What are the major or minor changes you have made that help lift you out of depression?